Sign up for Broadjam today to follow Mishkin Fitzgerald, and be notified when they upload new stuff or update their news! 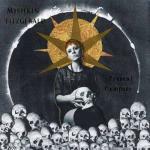 The debut album from Brighton-based pianist and singer Mishkin Fitzgerald. What are you fighting for, why and who? Didn't I grow so tired of you? And what do you get from tearing us in two? Haven't you grown so tired of you?